Owning a corporate or commercial property is a good investment but, like all business properties, it needs to be properly managed and maintained. It is the responsibility of the owner to ensure that their property meets all the necessary legal requirements and this can be a daunting task. Corporate property management companies, like Latitude Properties, are there to take the stress out of managing your corporate property investment. Fire safety is a serious concern for all cities and being up to date with fire safety regulations should be a priority for all corporate property owners. But knowing the fire safety regulations and actually complying with your local fire safety code are very two different things. All business and corporate property owners in Ontario are, by law, required to have an approved Fire Safety Plan for their building. This plan needs to ensure that your building has all the necessary safety equipment and that procedures are in place to protect and evacuate occupants and visitors during a fire. The Ontario Fire Code and its enabling legislation, the Fire Protection and Prevention Act of 1997, establishes fire safety standards for equipment, systems, buildings, structures, lands and premises. It consists of a set of minimum requirements respecting fire safety within and around buildings and facilities. Under this code, different types of property with different types of occupants have different requirements and this can be bewildering for anyone who is not familiar with national fire codes, as well as the Ontario Fire Code. All this may sound confusing, but complying with the Fire Safety Code does not have to be a daunting task if you have the right people to assist you with your property management needs. Latitude Properties can help you create and implement an effective fire safety plan, that meets all legal requirements and that will help protect the occupants of a property during a fire. Is the address of the building clearly visible from the street? Are fire alarms in good working order and have they been tested within the prescribed time frame? 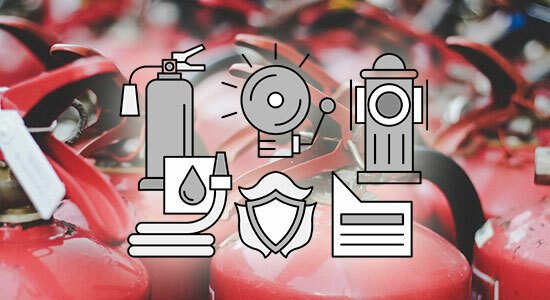 Are fire extinguishers well maintained and serviced within the prescribed time frame? Are there an adequate number of fire extinguishers for the size of the building? Are fire extinguishers clearly marked and easily accessible? Has a fire sprinkler system been installed? Is the fire sprinkler system properly maintained and in good working order? Are fire exit signs correctly placed and clearly visible? Are fire exit doors clearly marked and unobstructed? Do fire exit doors conform to local and national legislation? Are all garbage receptacles and other waste kept clear of fire exit doors? Has emergency lighting been installed and is it well maintained? Are all occupants aware of the Fire Safety Plan? Have fire safety drills been carried out within the prescribed time frame? Conforming to the Ontario Fire Code for corporate properties is not only a legal requirement, it is also a moral obligation. Contact Latitude Properties for assistance in creating and implementing your Fire Safety Plan and for all your corporate property management needs.